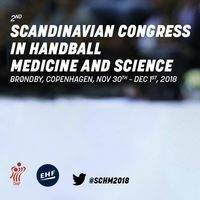 Following the success of the inaugural Scandinavian Congress on Handball Medicine in 2016, the Danish Handball Federation gathers experts in sports medicine and science for its second edition in Copenhagen. The conference for those interested in clinical and physiological aspects of handball will take place on 30 November and 1 December at Idrættens Hus in Brøndby. The programme includes practical workshops, keynote lectures and symposia on key topics in handball medicine and science, with a prominent list of distinguished Scandinavian and international speakers invited. Among the key topics in focus, the conference will discuss the managing of physical training and medical issues in an elite handball team, cover injury prevention strategies, return to play criteria and rehabilitation. Further information and registration for the congress can be found here.